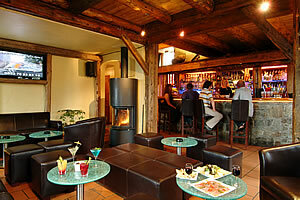 La Taiga is open every day for Lunch from 12:00 to 14:30 and Dinner from 18:00 to 21:30. We look forward to serving you all soon! La Taiga Restaurant & Bar in La Tania hosts a bright, modern, cocktail bar and larger restaurant upstairs. Open for lunch & dinner it is situated just across the main road from the bottom of La Troika beginners piste in the centre of resort. Access can be gained via a public lift next to the Montana Hotel which takes you down to the ski bus stop immediately opposite. For directions and our location on an aerial photograph click here.